Jan Brueghel belonged to a dynasty of painters whose first outstanding member was Pieter Bruegel, Jan’s father, who died when he was a child. According to Karel van Mander, Jan trained with his grandmother, the miniaturist Maria Bessemers, and with the painter Pieter Goetkindt. At the age of twenty-one he went to Italy via Cologne, and is documented in Naples in 1590, then in Rome where he met the Flemish painter Paul Bril and Cardinal Federico Borromeo. In 1595 and 1596 Brueghel was in Milan to where he followed the Cardinal, returning to Antwerp in October 1596. Jan Brueghel produced landscapes, allegorical and mythological paintings, genre scenes and still lifes, particularly flowers and garlands, a genre in which he attained great mastery and perfection. He was an esteemed artist whose paintings commanded high prices both in his own day and later in the 17th century. Collectors and patrons appreciated his refinement and the distinctive, soft and elegant brushstroke that Brueghel used to create detailed and delicate compositions, for which he became known as “Velvet” Brueghel. While on occasions he followed his father’s approach, his art is generally marked by a study of nature at first hand with an emphasis on beauty. The present copper panel became known to scholars and the public when it was in the collection of Antonio Colombo. 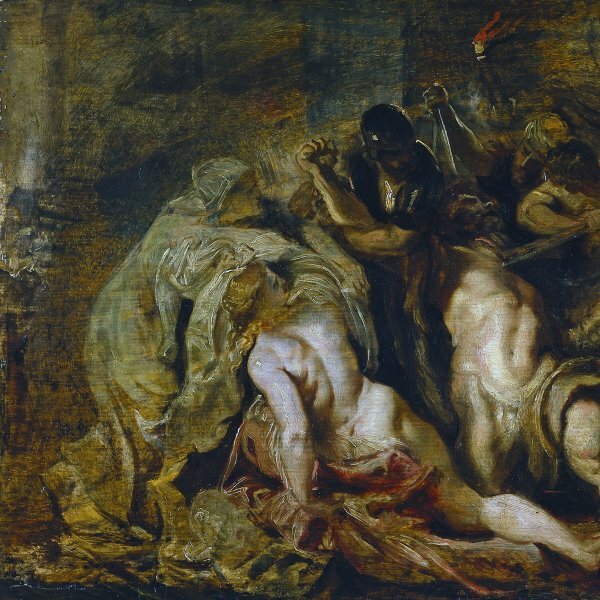 It was sold from that collection in Milan on the death of its owner in 1970 and was then with Silvano Lodi from whom it was acquired in 1979 for the Thyssen-Bornemisza collection. The panel was first published in 1979 in Ertz’s monograph on the artist, during which year it was included in an exhibition on Jan Brueghel held in London. Signed and dated 1596, this oil on copper is an autograph version of a painting in the Pinacoteca Ambrosiana in Milan, painted one year earlier and which was in the collection of Brueghel’s Italian patron, Cardinal Federico Borromeo. As Gaskell noted in his commentary on the painting, Brueghel frequently repeated his compositions in the form of replicas. The artist illustrates this episode from the public life of Christ in which he calmed the waters of the Sea of Galilee. The story is recounted in the New Testament and is mentioned in three of the four Gospels. Brueghel depicts the boat, lashed by the waves with Christ asleep inside, at the precise moment when one of the disciples decides to wake him before they are all shipwrecked. Also in the vessel are eleven of the disciples who make every effort not to be sunk, rowing and attempting to manage the sails. Brueghel places the narrative events in a setting that recalls another sub-genre of landscape painting, that of the marine view. While paying considerable attention to the main motif, he also focuses on the setting, using a high viewpoint and offering a broad panorama of a coastline that effectively combines real with imaginary elements. This is the case with the fortress on an island in the centre of the panel that can be related to a drawing of the Castel dell’Ovo now in the Boijmans Van Beuningen Museum, executed by Brueghel during his time in Naples. Brueghel uses a narrow but rich and glowing colour range in the present panel, with an emphasis on green, blue and grey tones that contrast with the intense and vibrant reds of the Apostles’ tunics, and the yellows and pinks of other pieces of drapery. The remarkable quality of the minutely detailed brushstroke is evident in all the details that fill this composition, for example the faces of the figures, and the care and delicacy in the depiction of the jagged coastline and the buildings of a large city on a bay evident in the distance. As Ertz noted, during this period Jan Brueghel painted a significant number of coastal scenes using the tonal range to be found in the present panel. 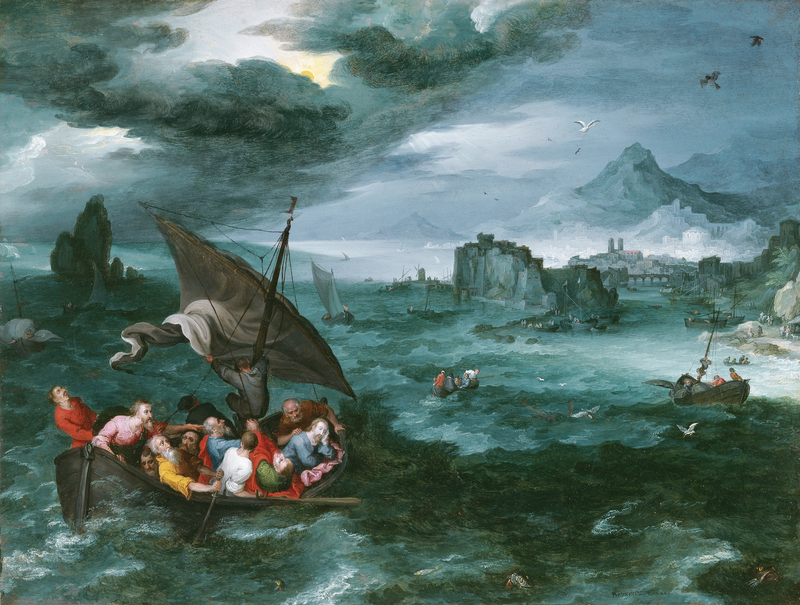 They include Storm at Sea with Shipwrecks in a private collection and Saint Paul’s Departure for Caesarea in the North Carolina Museum of Art, Raleigh.